Shower better, not less often. Is showertime your happy place? Who doesn’t love the relaxing, steamy experience of a hot morning or evening shower? Sorry to rain on your parade, but showers account for a whopping 17% of indoor water use. That’s an average of 40 gallons of water each day for a typical US family, which translates to 1.2 trillion gallons of water a year in the United States. But we want you to keep up with the showering… just in a much more efficient and sustainable way. Learning how to save water will help you save money on energy and water bills, and reduce the overall water footprint of your home. The easiest option, especially for those who really LOVE their shower, is to install water-efficient shower heads. The EPA’s WaterSense label designates products that ensure efficient water use in your home. Standard shower heads use 2.5 gallons of water per minute (GPM), while qualifying WaterSense shower heads don’t use more than 2.0 GPM; newer shower heads can get as low as 1.25 GPM with no change to pressure or flow. Quick installation of water-efficient shower heads in your home can immediately save money and water. How much? EPA estimates the average household savings at 2,900 gallons of water a year, or 370 kilowatt hours of electricity, equivalent to 13 days of power. If you don’t want to spend the upfront cash for efficiency upgrades, the second best solution is to just take shorter showers. If an average shower in the US is 8 minutes long and the flow of a standard shower head is 2.5 GPM, that’s 20 gallons of water just for one shower. Cutting down your shower time to 5 minutes or less can go a long way towards reducing your energy and water bill. Does your shower take forever to warm up? If so, you might want to think about installing a thermostatic shut-off valve. This nifty gadget is easy to install and helps minimize wasted energy and water by limiting water flow once your water reaches 95° or hotter. Just pull a cord to turn the flow back on when you’re ready to jump in! If you’re in the process of designing a new home, on-demand water heaters are a great option. These small gas or electric gadgets heat water instantly on the spot, so there’s no energy or water wasted. Wondering if it’s more water efficient to take a shower or bath? We can’t argue with the luxury of a bath, but it is, indeed, a luxury. 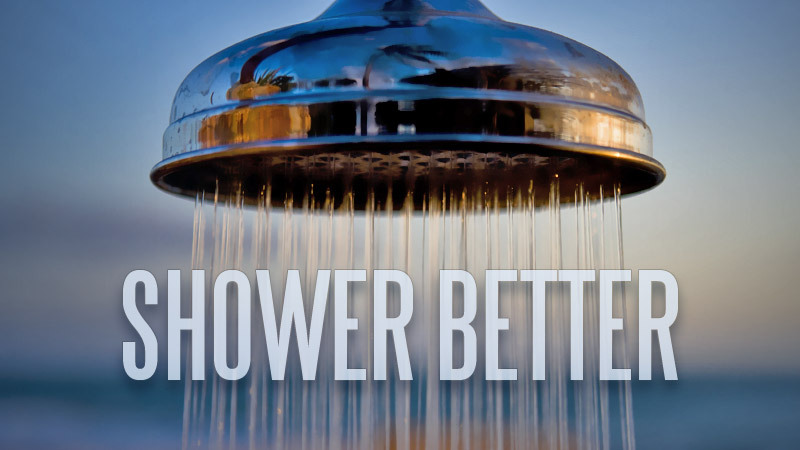 Assuming you have switched to water efficient showerheads, showers will always win for the lowest amount of water usage. If you can’t give up your bubbles, Umbra from Grist advises readers create their own “water offsets” by practicing taking shorter showers or skipping a shower now and then to justify the time in the tub.